OTTAWA, CANADA – The University of Saskatchewan hopes to fly a wrist-sized MRI to the International Space Station by 2016 in a standard Progress cargo flight, according to Gordon Sarty, a university professor specializing in medical imaging. Why is this important? It will help doctors keep track of the astronauts’ bone strength on orbit, Sarty says of his team’s invention. With NASA aiming to run its first one-year mission to the station in 2015, there is renewed emphasis on keeping track of all the nasty things microgravity does to astronauts’ bodies in space. Crew members spend two hours a day exercising, but still come back to Earth having trouble balancing, with weaker bones and muscles, and possible facing changes to organs such as the eyes. Although NASA runs MRIs on crew members before and after flights, Sarty said the ability to get even a simple scan in orbit would be useful — and quite quick. It would take just five to 10 minutes to perform, and would be simple for anyone to do as the scan would commence at the touch of a button. The Canadian Space Agency is allowed just 44 kilograms (97 pounds) to get the MRI to orbit under its utilization agreement on station (which is based on funding). A full-size MRI able to fit in a standard payload rack would have been about 800 kilograms (1,765 pounds), Sarty said. Modifications are necessary. Rather than using superconducting magnets to do the work in orbit, Sarty’s design proposes manipulating radio frequency waves instead. (More technical details here.) Sarty’s team currently has a $240,000 grant from the CSA to develop the technology, which goes for about the next year. Sarty said the International Space Station needs to be outfitted to a “Level 4” standard of medical care, meaning that it would include medical imaging on board to help monitor crew health. 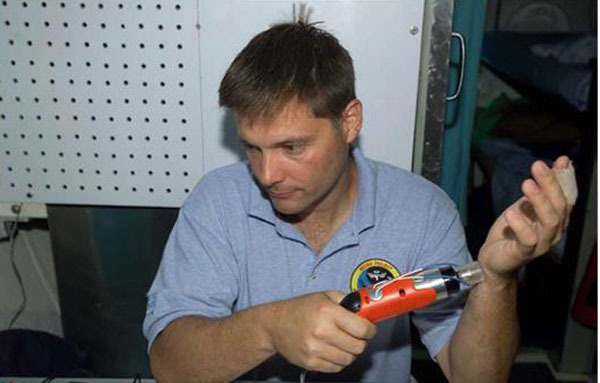 NASA’s Human Research Program Utilization Plan for the station (published in 2012) identifies the addition of ultrasound as a boon to ISS’ medical capabilities. Russian Soyuz spacecraft, docked to the International Space Station. Although Earth is close by for station missions, NASA’s standard of medical care for station has assumed a return to Earth could take days. Credit: NASA. As for “Level 4”, the NASA Space Flight Human Human System Standard (latest version available expired in 2012) defines Level 4 as “A moderate to high level of potential risk exists that personnel may experience medical problems on orbit. Risk to the mission is greater for medical issues beyond routine ambulatory medicine.” It also assumes a return to Earth can take days. Level 4 applies to Earth, lunar or planetary missions greater than 30 days, but no more than 210 days. The upside for Earth research? The portable MRI could be repurposed, in a sense, to bring into more remote regions. This is especially true of Canada, where tens of thousands of people live in scattered communities in the remote north.